The last several weeks in the Pittsburgh area and across the entire United States have been downright fridged. Even the places you’d imagine as warm are cold. I mean, even Disney World closed its water rides due to the freezing temperatures in Orlando Florida. Yes, FLORIDA! 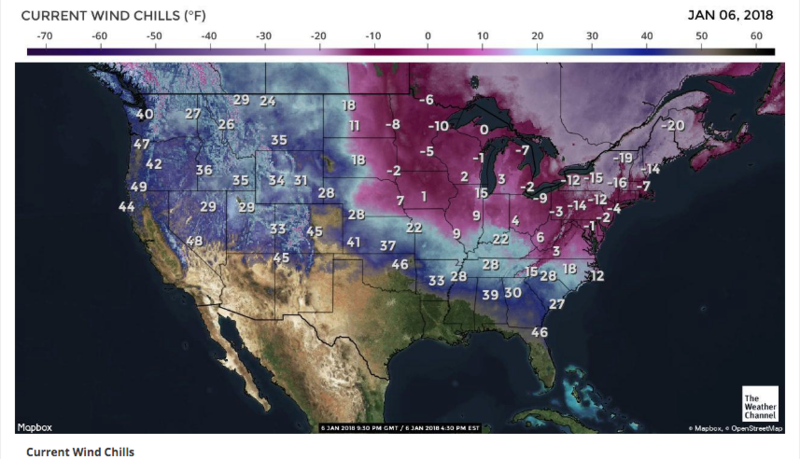 We can’t seem to escape the cold almost anywhere in the continental United States. We’ve seen numerous reminders on Twitter that the iguanas falling out of the trees in the Florida Keys weren’t dead, they were just cold, and that if you let them be or moved them to the sun they’d eventually warm up and start moving. And yes, someone apparently had to learn this lesson the hard way. The winter storm that went up the east coast earlier in the week closed the airport in Charleston, South Carolina with 6 inches of snow. If you’re from Boston you’re probably thinking 6 inches shouldn’t cause a ground stop, but remember — they don’t have snow plows at the airport in the Palmetto State. The windchill in Maine is -20. The warmest spot on the map is San Diego at a nice and toasty 69. We’ve talked about it before, Amanda and I are sunseekers. The two of us just thrive on warm weather. We don’t have the opportunity to flee south at the moment, no matter how much we want to. So we’ll cope by only leaving our front door when we have to and spending a lot of time cuddled up under the duvet. We hope you all stay warm and snug until this passes.